Watch for this to happen more and more often. PASADENA, Calif. – An international team of experts supported by NASA and the European Space Agency (ESA) has combined data from multiple satellites and aircraft to produce the most comprehensive and accurate assessment to date of ice sheet losses in Greenland and Antarctica and their contributions to sea level rise. This rate of ice sheet losses falls within the range reported in 2007 by the Intergovernmental Panel on Climate Change (IPCC). The spread of estimates in the 2007 IPCC report was so broad, however, it was not clear whether Antarctica was growing or shrinking. The new estimates, which are more than twice as accurate because of the inclusion of more satellite data, confirm both Antarctica and Greenland are losing ice. 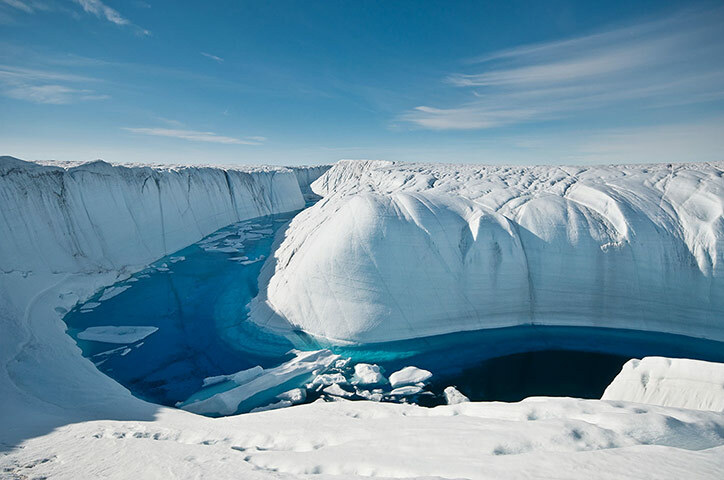 Combined, melting of these ice sheets contributed 0.44 inches (11.1 millimeters) to global sea levels since 1992. This accounts for one-fifth of all sea level rise over the 20-year survey period. The remainder is caused by the thermal expansion of the warming ocean, melting of mountain glaciers and small Arctic ice caps, and groundwater mining. Monthly changes in Antarctic ice mass, in gigatones, as measured by NASA’s Gravity Recovery and Climate Experiment (GRACE) satellites from 2003 to 2011. The data illustrate the continuing loss of ice from the continent. 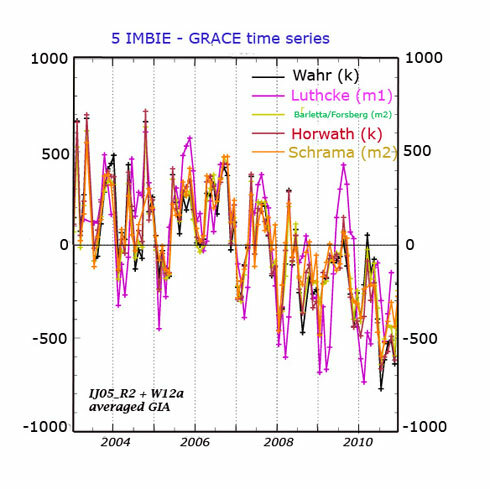 The plots here depict results from five different IMBIE team members using different methods. The data have been adjusted to reflect new models of post-glacial rebound. THE world is on the cusp of a “tipping point” into dangerous climate change, according to new data gathered by scientists measuring methane leaking from the Arctic permafrost and a report presented to the United Nations on Tuesday. While countries the size of Australia tally up their greenhouse emissions in hundreds of millions of tonnes, the Arctic’s stores are measured in tens of billions. The report estimates the greenhouse gases leaking from the thawing Arctic will eventually add more to emissions than last year’s combined carbon output of the US and Europe – a statistic which means present global plans to hold climate change to an average 2degree temperature rise this century are now likely to be much more difficult. Until very recently permafrost was thought to have been melting too slowly to make a meaningful difference to temperatures this century, so it was left out of the Kyoto Protocol, and ignored by many climate change models. The rate of melt was “deeply concerning”, said Andy Pitman, the director of Australia’s Centre of Excellence for Climate System Science, an adviser to the Climate Commission, and a lead author of the Intergovernmental Panel on Climate Change’s reports. “It had been assumed that on the timescale of the 21st century, that the effects of methane release would be relatively small compared to other effects – that’s why it has been largely left out of the climate models,” Professor Pitman said. The report presented to the UN said a tipping point could still be averted if the world moved to cut emissions from fossil fuels fast. I’ll be heading to San Francisco this weekend to once again attend the American Geophysical Union conference, where I’ve been asked to present (!?) on “Effective Use of Social Media in Communicating Climate Science”. But the biggest story will be the unfolding extreme weather event that will give all attendees a reminder that, for climate change, we all have a front row seat. The change comes Wednesday afternoon with what will amount to a “warmup” storm that should deliver 0.5 of an inch to about 1 inch to much of Northern California. That system, Van Cleave said, should be brief, giving way on Thursday to a brief short drying on Thursday. By late Thursday, that “atmospheric river” will be headed straight for the capital area and will bring strong southerly winds, he said. I’m seeing some signs of a potentially historic storm for portions of the western USA between Friday and Wednesday of next week as a series of very moist storms push inland from the Pacific. I expect some flash flooding (and river flooding) for the San Francisco Bay Area, but the most severe flooding (and mountain snows) will take place from Marin county into the mountains of northern California and the Coastal/Cascade range of Oregon. The ECMWF model, which seems to be doing the best job overall in this new weather-on-steroids environment, prints out some 16-20″ rainfall amounts over northern California and southern/western Oregon by Sunday; two surges: one Friday, a second front pushing in Sunday. WSI’s high-res RPM model confirms this as well, which increases my confidence level. The ECMWF model prints out 4-5” for San Francisco, but 8-10” for Marin county, just north of SFO. Also, Flood Watches are posted for some rivers in Northern California. One of these rivers is the Navarro River, which currently has a stage of 2.9 feet. Here is what is impressive. The flood stage for the Navarro River at Navarro is 23.0 feet. That means that it is currently 20 FEET below flood stage, yet the NWS has determined that it is prudent to issue a Flood Watch for the river. Further, flood stage may be reached by Friday morning and the river could hit 26 feet by midday Friday. So between Thursday morning and Friday afternoon, the river is expected to rise as much as 23 feet. That is a tremendous amount of water. The storm that flooded St. Mark’s Square in Venice with a meter of water today also produced a tornado. A real Great Plains style tornado at that. Here is an image from the Meteosat showing the storm. If the budget cuts do not get it, the U.S. will have an ultra modern weather satellite like this in a few years. New video for the Yale Forum on Climate Change and the Media. I interviewed hurricane expert Kerry Emanuel of MIT, and asked him for a blow by blow analysis of the GOES satellite animation of hurricane Sandy. He expertly complied, and added a number of additional details. I’ll be posting more of his raw interview later. I also talked to Jason Box, of the Byrd Polar Center, and added in a number of other resources for context, including a revealing anecdote from former GOP congressman Joe Scarborough.